This past summer I was excited to find myself back in New York for the Nomading Film Festival and I was almost even more excited to take another food tour with Foods of New York. When I had been in New York in February I took my first food tour with them called the “Nolita” Food Tour and was in LOVE. 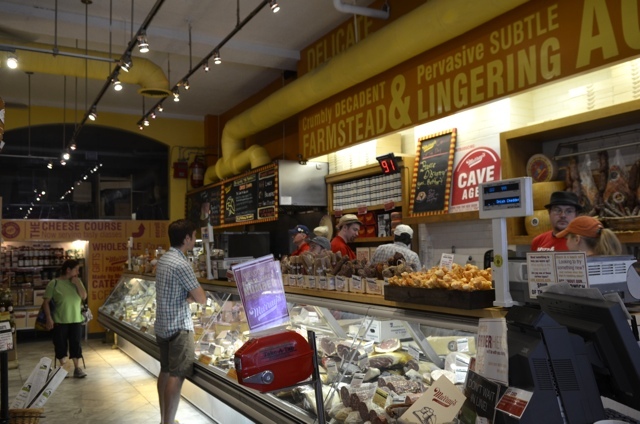 This time I chose to do the Original Greenwich Village Food and Culture Walking Tour and was not disappointed. It was a nice sunny day, and our tour guide Bert was all smiles. I showed up having not eaten yet for the day and by far this was a great decision. 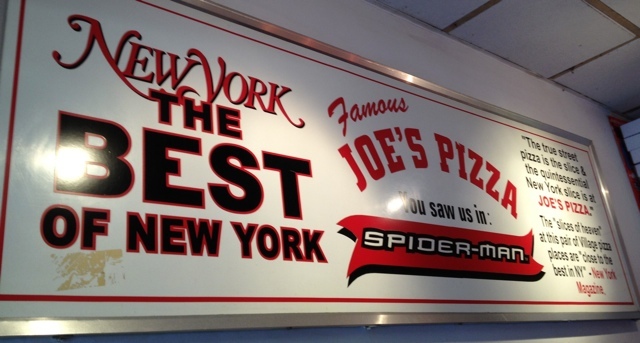 We started with the famous Joe’s Pizza. Remember in the first Toby McGuire Spiderman movie? 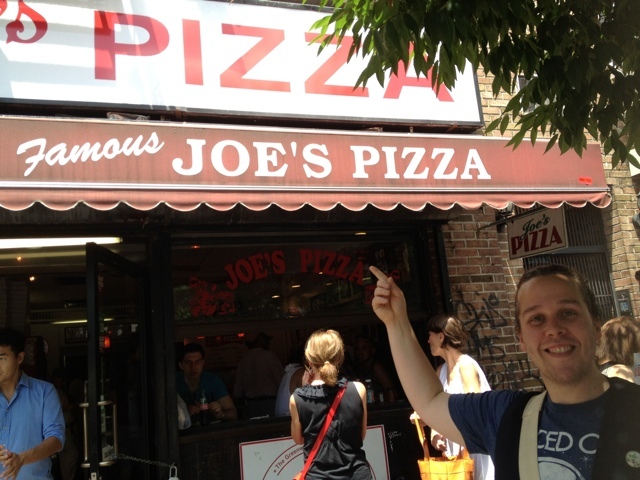 Joe’s Pizza was the pizza shop he got fired from in the movie. 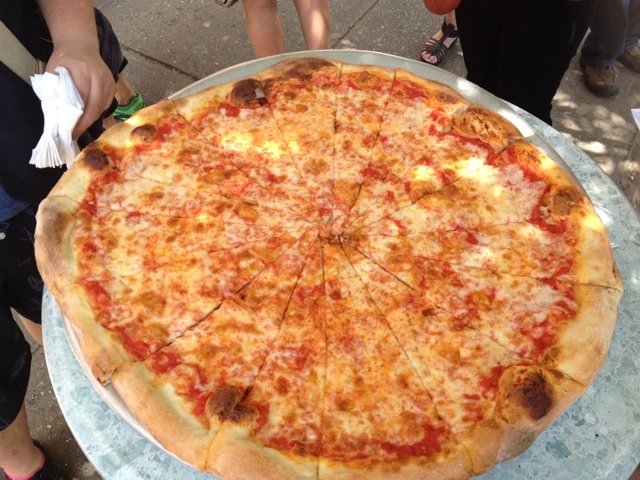 We ate a classic New York style pizza based on Neapolitan and it was gynormous… well 16”. Simple and delicious. Next we headed for my favorite kind of shop, a store that sold a million varieties of Olive Oil and Balsamic Vinegar called O & CO. Not only did we get to try a few kinds but I also learned a lot about Olive Oil that I hadn’t known before. They told us not to buy Olive Oil in a clear container as most likely it has food coloring in it which can hide the fact that it might of gone rancid. Apparently there is no such thing as Extra Extra Virgin Olive Oil. Once bottled should be used within three years. Once opened Olive Oil should be used within a year. 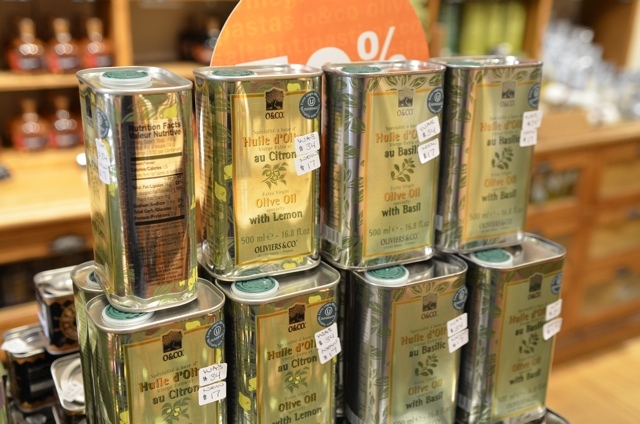 Olive oil should only be used for medium to low heat cooking. If it gets to hot it becomes transfats which your body has a harder time digesting. Everything they sold was hand picked and first cold pressed, these guys were pros, perhaps even Olive Oil snobs. But in a good way. The also sell vinegars and other gourmet specialties. 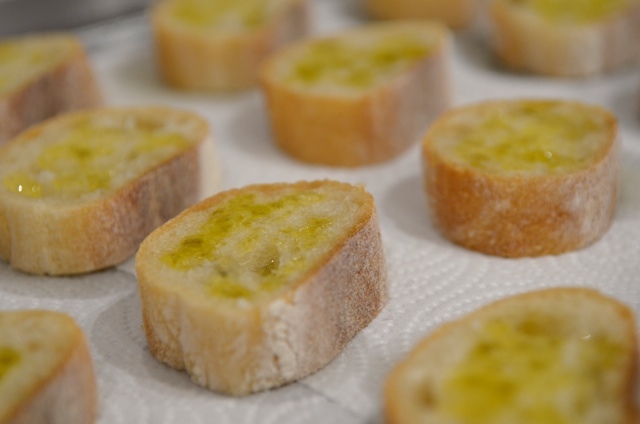 Our samples of fantastic Olive Oil on a french baguette. Alot of the stores and restaurants on the Greenwich Village tour are very small so a couple times we enjoyed some curb side dining which is a fun experience in its own. Especially when random strangers not in your tour group reach out and try to snag some of the food. We almost had to make a barrier around Bert at one point to keep one lady at bay who wanted to eat our rice balls. 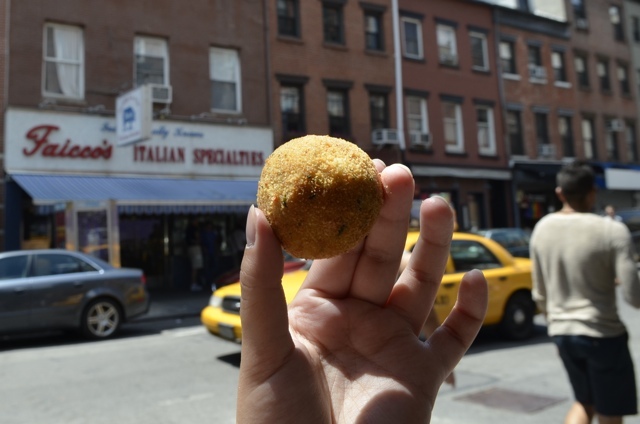 Across the street from O & Co was Faicco’s – Italian Specialty Shop and what Bert brought us over from there was called “Arancini” aka rice balls. This was my first taste of a rice ball ever. It was still warm to the touch from being fried fresh for us. I bit in not knowing what to expect and found heaven. Ok… maybe a slight exaggeration but I kid you not it was DELIGHTFUL! Made of a mix of 3 cheeses fresh ricotta, mozzarella and grated romano. Also added is salt & pepper, parsley and of course the rice. 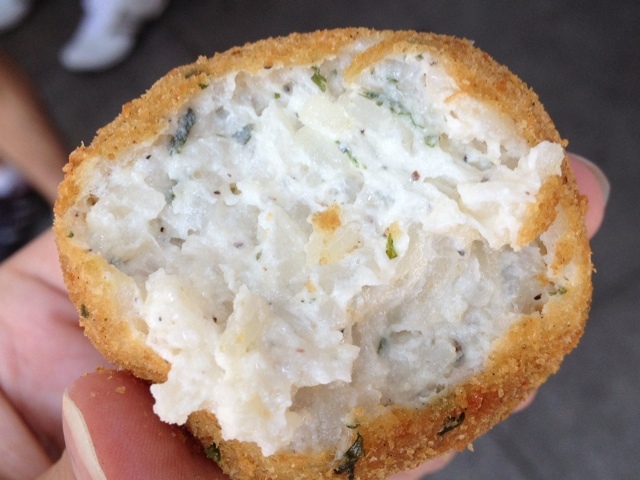 Rolled into a ball, dipped in egg, coated in bread crumbs, and then deep fried. Voila, a tasty rice ball! 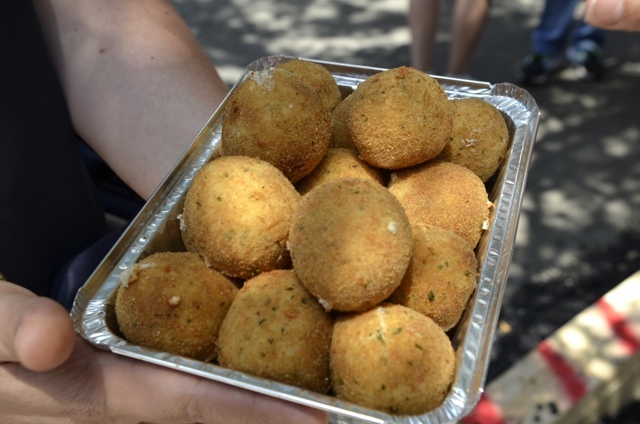 Crispy breaded fried balls of risotto. Its like a piece of art. We were headed to a restaurant next called “Palma”. An Itlanian Restaurant owned by a lady of the same name. We were taken through the restaurant into a small court yard /garden like area and into what seemed like another building. I soon learned this other building was actually an original “carriage house” that has been there since 1810. In the carriage house is where they have private events with “the warmth and spirit” of being home. 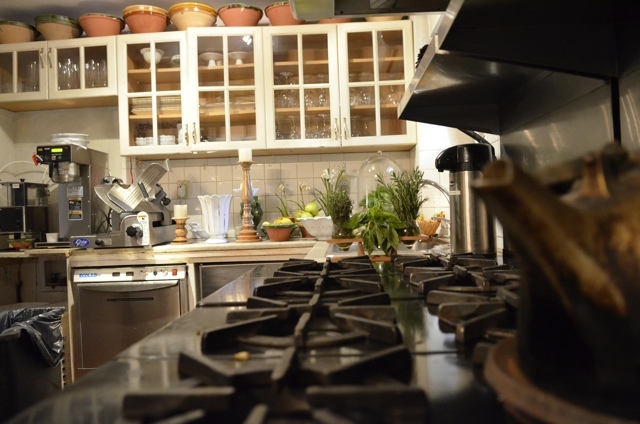 The kitchen in the Palama Carriage House. At Palma we had a taste of the Cavolfiore Palma. 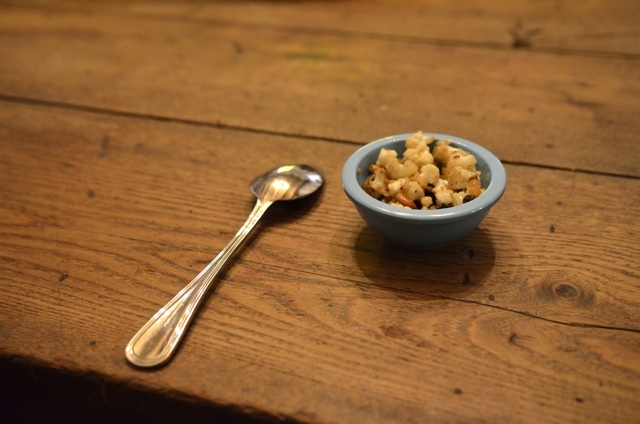 Sautéed cauliflower florets with onions, roasted pine nuts and currants. Typically I’m not a big cauliflower fan, but this I could definitely learn to love. The guy next to me passed and didn’t try any. People like that on food tours make me wonder… “Why the heck are you on a food tour to begin with? !” I also live by the rule of “try everything once”. After Palma we learned more about the neighbourhood and history and we saw one of Mario Batali’s first New York restaurants called Pó. 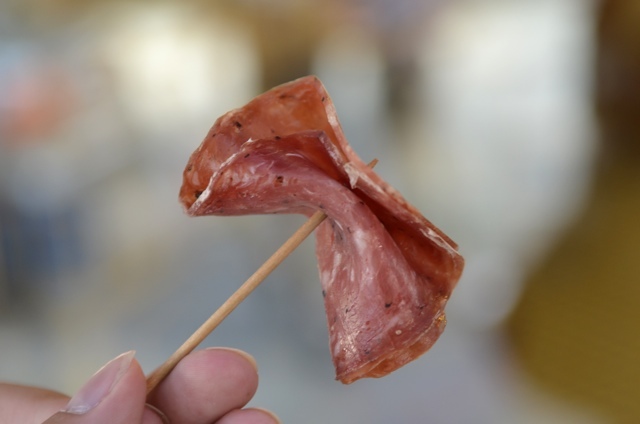 We were then headed back down the street to the wonderful Faicco again sampling their popular Italian Sausage Sopressata, an italian dried salami. This time we also had a chance to take a peek inside the tiny shop to be amazed at everything they had to offer. 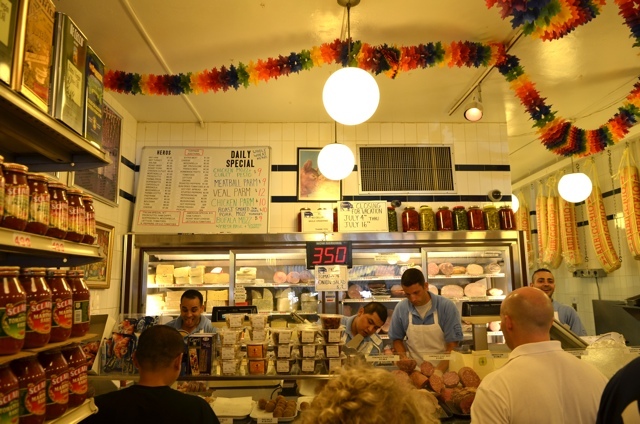 Some of the friendliest guys in New York work at Faicco. Lots, and lots of good eatin’. 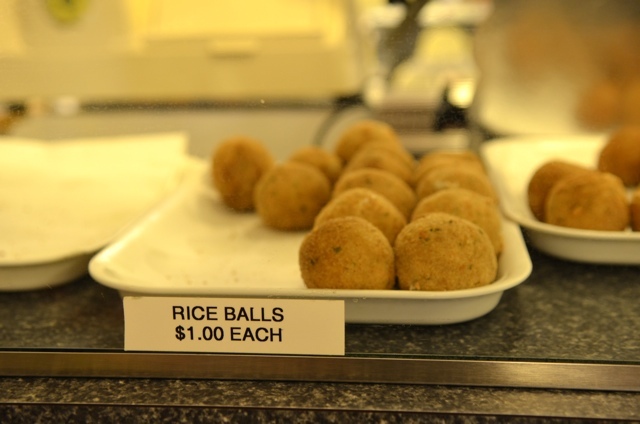 And I “almost” had another rice ball… almost. A short walk from Faicco, the following stop was across 7th street to a bar and restaurant a tad on the classier side called Centro. 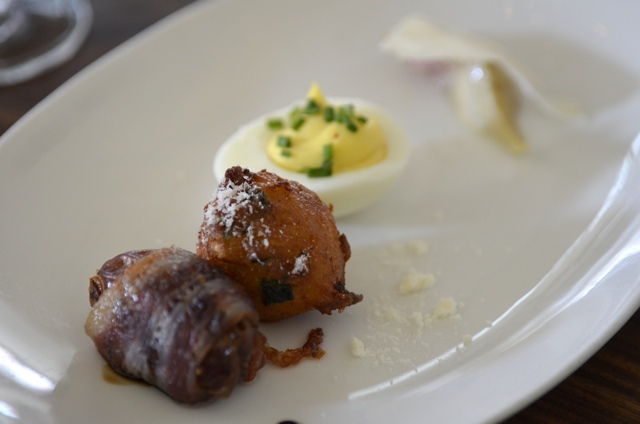 We tasted a few samples from their appetizer menu like the zucchini fritter, devilled egg with truffle, steamed artichoke with parmesan and the to die for bacon wrapped date with gorgonzola cheese. I also helped myself to a fancy drink. 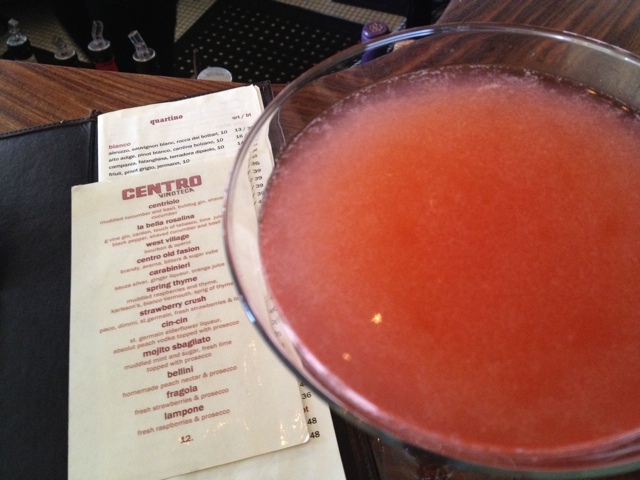 Centro had a great drink and wine list. These were almost a tease, I wanted more! By this point, from all the food we have been eating I was beginning to get a bit full. But then Bert mentioned cookies and I suddenly wasn’t completely full. We walked down the block and learned more about the houses and history in the area including seeing where some celebrities lived and did live along with the location of a restaurant that use to be a shoe store that was a front for a speakeasy. It would of been cool to live back in the speakeasy days where you would have to use a secret password to get into a place. 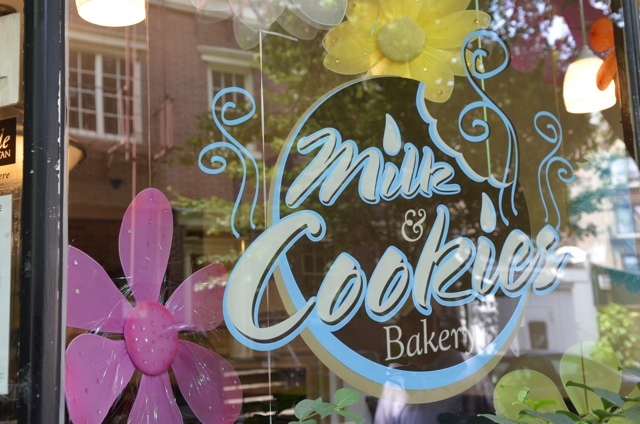 Our 7th stop was “Milk and Cookies Bakery“. We could smell the cookies from down the block and as we walked into the small shop we could see workers baking cookies, making cupcakes and all kinds of other delicious treats in the back. 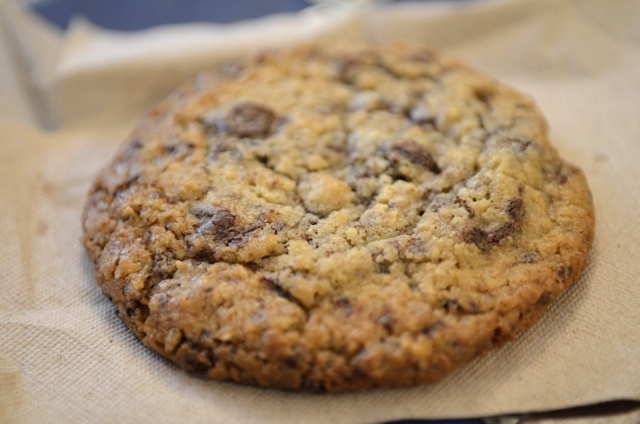 We were given the classic chocolate chip cookie, served still warm. They were a delightful treat. I have since heard that they now sell a cookie called a “Bacon Smack” and the cookie has, you guessed it – bacon!! in it along with cranberries, dark chocolate, toffee and graham cracker pieces. OMG I need to go back now! From Milk and Cookies we only had two stops left and we headed back across 7th street to lovely shop near Faicco’s called “Murray’s Cheese and Gourmet Foods” and I was quickly learning that Greenwich Village’s name should soon be changed to Gourmet Village. This place was Cheese Heaven. I’m not sure if I have ever seen so many different types of cheeses in one place. These guys love their cheese so much they even have a cheese of the month club and you can take courses there and learn how to make your very own cheese! 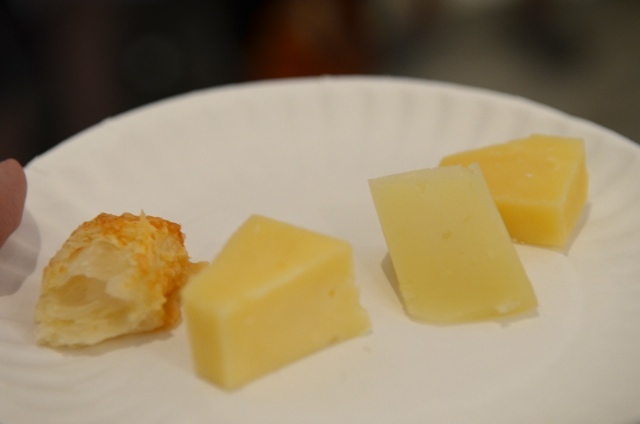 We got to sample 4 different kinds of cheese and I might of helped myself to a couple extra, I couldn’t resist. I wouldn’t complain if these samples of cheese were a bit bigger, full or not, its cheese! Bert then told us we had one stop left and we would finish off with a dessert. We crossed the street and waited outside of a place called Rocco’s standing next to an italian ice stand. 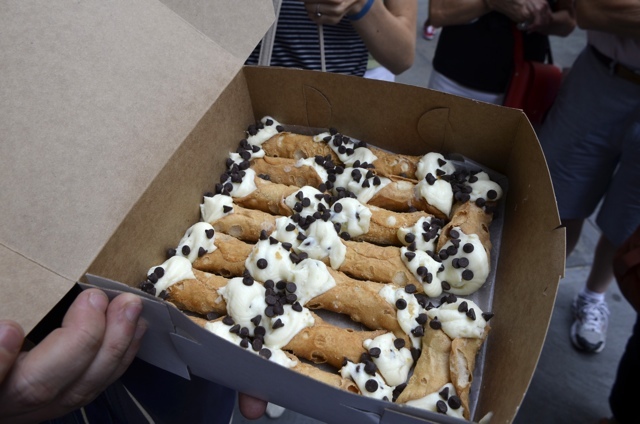 Bert stepped out onto the street again several minutes later from inside Rocco’s holding a box which he opened up to reveal some of the most perfect cannolis ever. He had taken a few extra minutes to come out with them as each cannoli Rocco’s sells is piped fresh with the cream so they don’t go soggy. These guys know perfection and if you google them you will see a lot of other people agree as well. A big box of AWESOME! The perfect end to another great tour by Foods of New York. I find the staff to always be so friendly and they truly do love their jobs. 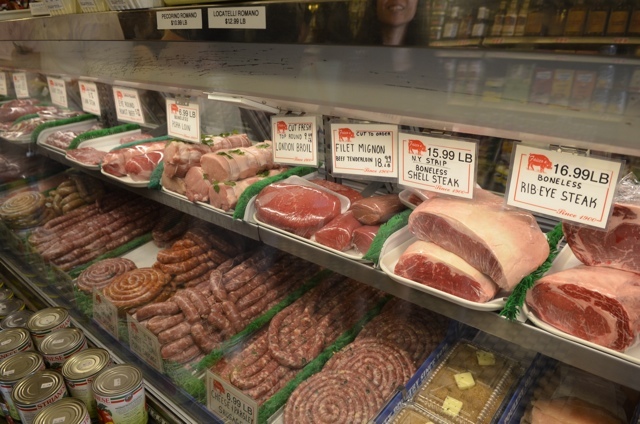 They are extremely knowledgable and rarely can you stump them with a question and if you can’t tell already the restaurants and shops that they select to have featured on their tours are some of the best around. Thanks to Bert my tour and Foods of New York for having me on the tour. All opinions expressed are my own. I actually just did this tour and it was good except we had (2) babies (aged 1 to 2 years old) on the tour and it was really not pleasant. I have done many food tours and never had children this little in the group before. The one was running all around the Olive Oil shop, thank god didn’t knock a bottle on top of them. The village is a great area and I plan to check it out more often when in the city. RJ was the best tour guide I have ever had. My mom and I went on this tour yesterday and loved it. RJ was really nice and knowledgeable about everything. He made the tour! 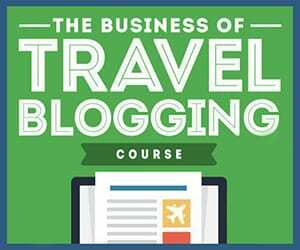 If you book this tour ask to be on RJ’s tour. No one could be better than him. Whatever he gets paid should be doubled!!!!! Joan and I loved you! Thanks for the great post. Awesome job! You were a delight to have and I’m glad you enjoyed it. The pics are amazing! Thanks again so much! This looks amazing. I can hardly stop looking at your pictures. WOW, such a great idea to discover NY through food! You hit all the amazing spots in the village! Looks like a fabulous tour and some of the best food you will find. 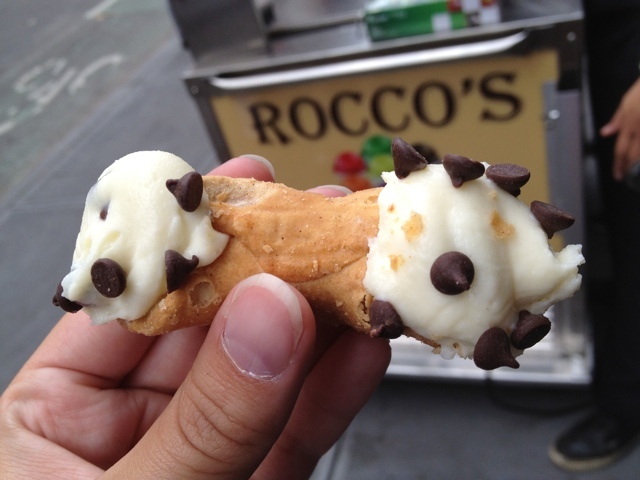 Rocco’s does have some of the BEST cannoli ! !